Because interest was shown in an idea I had yet to even express, I'm adding it here so as to not get it mixed up with the zombie thread. Around the site of the initial outbreak of the QT plague, mutations are more extreme and bizarre, and the alien goo is more potent. It's cable to change the structure of much of the substances it contacts, be it metal or flesh. What's more, no lifeforms are truly safe from the infection, and those in close proximity to the goo can even mutate amongst different species, fusing creatures into nightmarish cross-stitches. Thus, this thread will focus on these things, and the animals mutated by the infection. If you have any ideas, or models you wish to use, propose them and we shall see how viable they are, then make rules! I'd just like to point out, while manbirds may be a pleasing subject, the likeliness of a birds DNA fusing with mankind and alien and ACTUALLY MAKING SOMETHING THAT FLIES is almost utterly 0. Consider that within proximity, the alien substances causes mass mutation, trauma, cancers and all sorts of intensely destructive contagion and crippling growths. So rather than a Bart Simpson fly boy, picture.. the Fly. It won't fly, it won't be pretty.. but it'll still want to kill you for trying to shut it in a jar. This will be the place for all things wild, in general. So if you want zombie dogs, zombie cats, zombie zoo/ wildlife park animals, feel free to suggest it IF YOU KNOW THE CITY OF LONDON AT LEAST HAS THEM. Just to clarify, just because I call them "zombies" needn't mean they are undead monsters. They may well be horribly mutated by the infection, as it affects humans very differently to wildlife. If it's going by a chromosonal thing, then apes would be affected differently. Thus, apes would suffer as random a change as other animal species. But hell, even mutation can have stabilities! Now I have to wonder where London zoo might be in relation to the Emirates stadium..
A disgusting variety of mutation effects the vast majority of the wildlife that feeds on the corpses of the zombies that are killed.. For good. One creature seen often is said to be some sort of maggot, though people tend to refer to them as slugs. Often "gob-slugs", due to their unpleasant mouth-parts. They can vary greatly in size, and are generally too slow and unpleasant for most survivors to bother with. But when they swell in population, it's often imperative that they are culled, left safe-zones be overrun. They are found in a few sizes, the least dangerous being more of a swarming pile, made up of many. Sometimes, however, they can grow to be larger than your average family dog. Especially when they start chasing you. Small would be what you would consider more like normal sized maggots, perhaps as big as earthworms. So to model them, small snakes of greenstuff. Medium would be heading up to around a foot long. However big you want them. If you wish to make say, "enormous" maggots, post your proposed rules and I shall see how fair they seem for the reward granted. Of course, the most important aspect of using them against survivors is fair use.. It's no good swarming them in an inescapable wave of large ones..
Perhaps small. That'd be pretty damn fun. But nothing they'd not have a chance against, at least on their own. The large maggot has a short ranged attack. It has a maximum range of 6" and uses the maggots BS skill. It's S 2, and as a -1 save modifier. Small and medium are swarms, and must be represented as such. 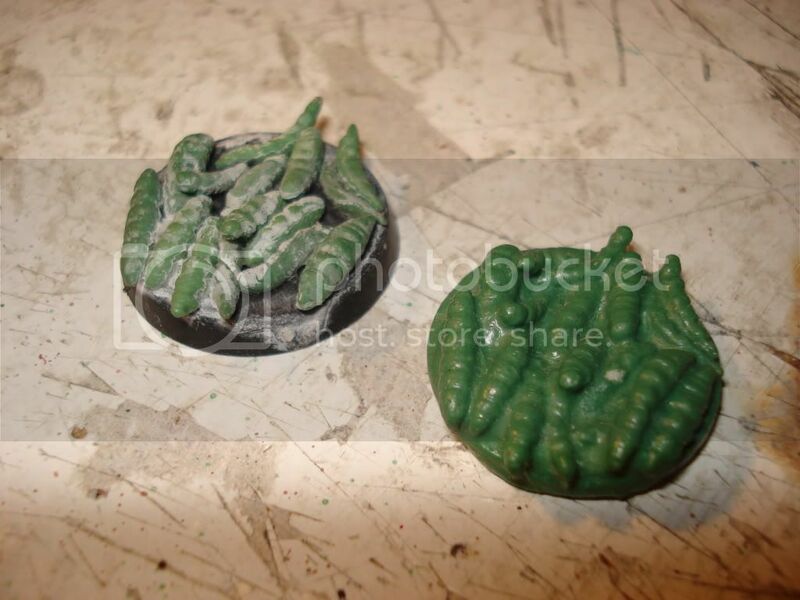 Bases can be any size you like, so long as you have at least 5 maggots per base. They are small targets and impose a -1 to hit modifier on firearms that do not use templates. If I had more, there would definately be more of them. That's very silly, in a way I quite like.